I've got a 4k (hiDPI) external main monitor and I'm trying to connect a 1680x1050 external monitor to the left of it. 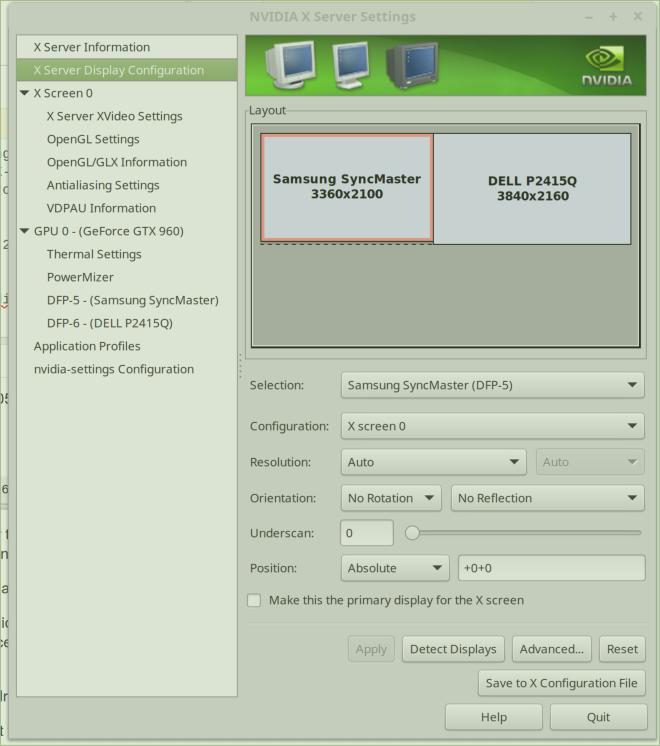 which seems like it should work, and when I look at what the computer thinks is going on in nvidia-settings it correctly displays a 3200x2160 monitor to the left of my 4k one. However on my external monitor just shows black with a flickering line at the top of it. The only way I can correct this is to reset the scaling back to 1x1 at which point the image returns (while maintaining the X-server size. This means there's just deadspace that I have to scroll through to get between my monitors). So I think the problem is specifically to do with the 2x2 scaling in xrandr. I'm not sure what to do? I have exactly the same problem. Scaling up to 1.5x1.5 seems to work here. Edit: oops.. just noticed that that issue was likely opened by you yourself. Did you manage to find a solution? While close to a necrobump, at least provide details on your specific situation. Which output you try to scale and on what desktop environment. This is usually just a hardware limitation in some field. As this topic is over a year old, and OP hasn't been seen since they started it, you're unlikely to get a response; please open a new topic for your issue.